While Gaara had initially tried to be friendly towards others despite their fear of him, Yashamaru's actions and words changed him. 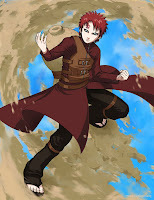 Realizing that nobody loved him, Gaara used his sand to create the kanji on his forehead,He became emotionally withdrawn, all but silent, and consumed with a bitter loathing for everyone but himself. Gaara's insomnia, forced upon him by the fear that the demon inside him would eat away at his personality if he were to fall asleep, only furthered his instability and desire to kill. In time, Gaara's father came to appreciate Gaara and the uses he could serve, and canceled all assassination orders in the hopes that Gaara would become an effective tool for Sunagakure. 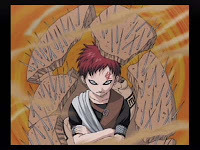 Gaara is almost like a mirror image of Naruto; they're opposites, but they're very similar. "Gaara's upbringing was very much like Naruto's. He was universally rejected and ignored, living a superfluous existence. But Naruto and Gaara have different viewpoints on their backgrounds; that's why they come into conflict".